MOSCOW - Russia has been working to push Iran away from Israel's border with Syria, diplomatic sources told Haaretz Wednesday evening. In return, Israel is expected not to intervene the stabilizing of Syrian President Bashar Assad’s regime as he retakes Syria’s south. Prime Minister Benjamin Netanyahu meets with Russian President Vladimir Putin at the Kremlin on Wednesday, where he arrived for a two-day visit. Putin shakes hands with Netanyahu during their meeting at the Kremlin in Moscow on July 11, 2018. MOSCOW - Russia has been working to push Iran away from Israel's border with Syria, diplomatic sources told Haaretz Wednesday evening. While Russia is toiling on this effort, Israel has avoided intervening and disrupting stabilizing efforts by Syrian President Bashar Assad’s regime as he retakes Syria’s south. "We intercepted [the drone] and we will continue to act firmly against any infiltration, on land or in the air, and we expect everyone to respect [Israel's] sovereignty and that Syria will observe the separation agreements," Netanyahu told Putin at the beginning of the meeting. As for Iran's presence in Syria, Netanyahu told the Russian leader that, "Our opinion is that Iran should leave Syria, this is not something new for you." The second aspect higlighted in the meeting, Netanyahu said, “was the question of Syria and Iran ahead of the upcoming summit." Also headed to a separate meeting with Putin Wednesday is Ali Akbar Velayati, a senior adviser to Iran's Supreme Leader Ayatollah Ali Khamenei. #BREAKING: Reports of Israeli strikes in Syria, probably related to UAV incident earlier in the day. UPDATE: Additional strikes now reported. BREAKING: Israeli jets fire several missiles at some positions held by Syrian army in vicinity of town of Hader and Tal Kroum Jaba in Qunietra; only material damage reported, no casualties. via SANA. Well, if Israel didn't then Russia did, because someone did. The missiles were targeted over al-Najal. Israeli enemy aircraft fired several missiles at some army posts in the vicinity of Hadar and Tel Krom Juba and limited damage to the material. Syrian state TV now confirming airstrikes. ^^^ like he can talk about "trust". I don't trust Russia but I don't trust Graham either. #BREAKING: #Russia didn't support plan for #Israel's airstrike against #IRGC & its proxies in #Syria, but #Israel Defense Force shelled #Syria Army & #Hezbollah in #Quneitra indirectly helping #FSA, Jabhat Ansar al-Islam & #ISIL/#Daesh to launch two offensives against #SAA there. #IAF 7-7-300 up from Ben Guiron, climbing at a stately 1400 ft/m. #Quneitra : Overnight Israeli strikes on Ba'ath killed 7 Regime force members killed and wounded dozens of others. ^^^ it's almost 9 PM there now, not sure if they are talking now/tonight or last night. Either is possible. UPDATE: Report of a second Patriot interceptor launched. UPDATE: Two explosions heard in the Golan. #BREAKING: The Patriot missiles were reportedly launched at a UAV launched from #Syria that was crossed the border into #Israel. Syrians report an aircraft intercepted over Quineitra. Confirmed — 2nd time in 3 days: IDF fires Patriot missile at drone incoming from Syria. Unclear if this one shot down. NATO Boeing E3A Sentry heading towards Israel currently over the Mediterranean. If you’re not sure the E-3A Sentry is an airborne early warning and control system aircraft. #UPDATE following @IntelDoge report. NATO E-3 Sentry is currently circling south of Cyprus and monitoring Eastern Mediterranean Sea. This flight was underway before the drone shoot down, it may be retasked to provide support for whatever is coming in the area, but NATO has been flying sorties there on and off for about a week, so they likely have something else going on. 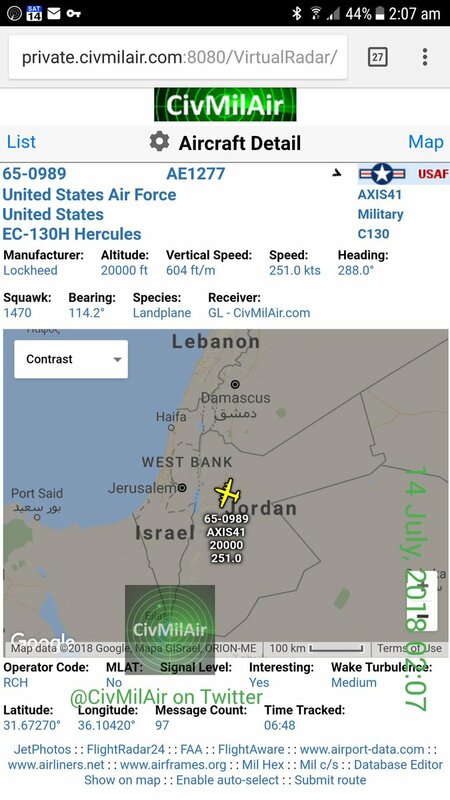 I feel after dark (around 10:30-11:00) we’ll see Israeli intelligence planes show up, then not much longer after that Israel will strike Syrian targets again like they did the other day. Just a prediction. anyone tell me what this means? The plane was hit by an electronic attack? Or was a person/group hit by one instigated by the plane?